Today's Image of Mars shows huge, bright mineral veins on top of the central uplift of a crater measuring 50km in diameter. The central uplift measures 5km wide and is made up of bedrock dredged up from deep under the surface. Mineral veins are formed when water flows through fractures, depositing minerals. Heat from the impact that created this crater melted ice and created a hydrothermal system that may have been capable of supporting life! Other areas on Mars have also shown signs of previously going through hydrothermal activity, which gives hope that it was once habitable since two of the requirements for life as we know it are water and heat! 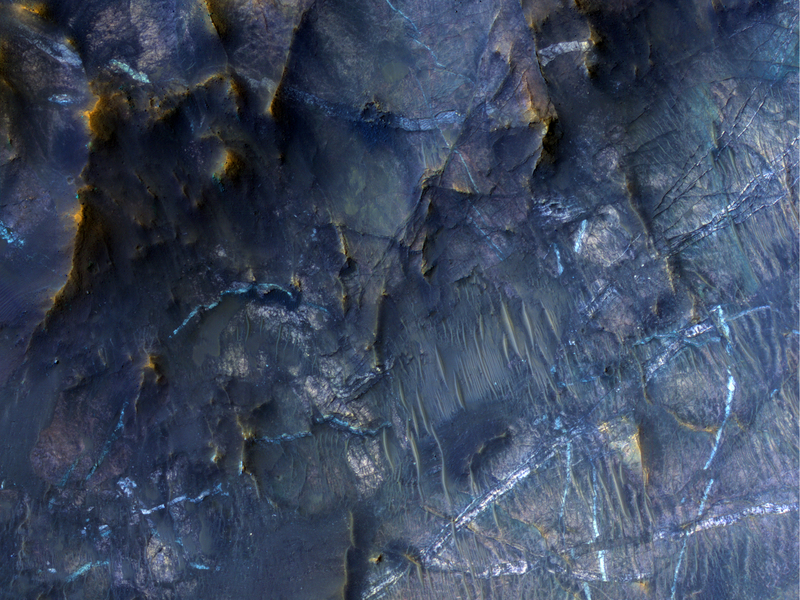 Mars Exploration Rover Opportunity recently discovered a small mineral vein called Tisdale.